British online magazine DataTransmission is well known for its coverage of all type of dance music, from techno, house, dubstep and all other genres in between, reporting from all around the UK and hotspots such as Ibiza, Aiya Napa and various other European resorts & cities. 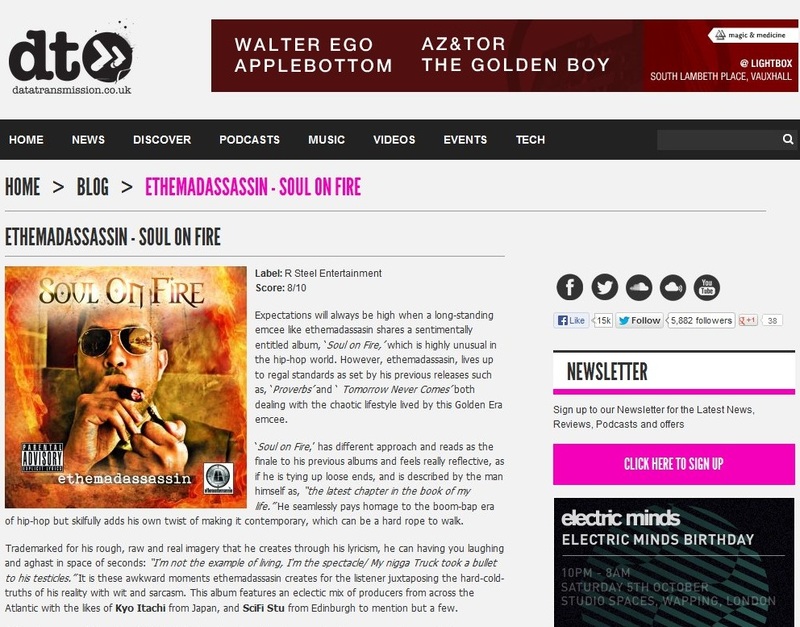 They also like their rap and hip hop music, and have just reviewed the new album Soul on Fire by rapper ethemadassassin, currently based in Los Angeles but most associated with his native North Carolina where he started out performing in the 90’s. 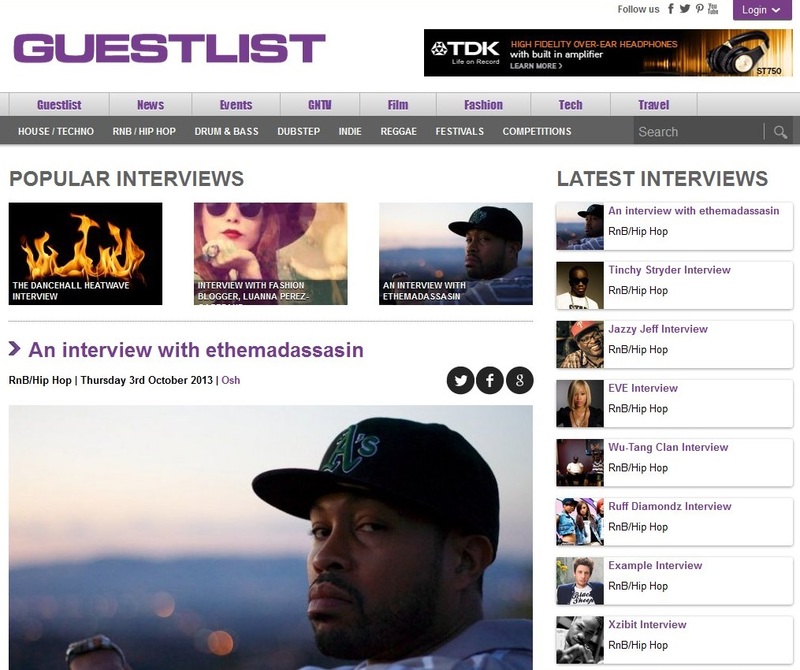 “ethemadassasin, lives up to regal standards as set by his previous releases such as, ‘Proverbs’ and ‘ Tomorrow Never Comes’ both dealing with the chaotic lifestyle lived by this Golden Era emcee” is how the review opens which notes his lyrcism, wit, humour, sarcasm and “hard cold truths” in what is an audio biopic of his life from his early days to the “latest scene in the movie of his life today”. The album has received much credit for its open & honest approach, owning up to past mistakes, acknowledging struggles and successes, and also having a healthy dose of retrospective flava for those who remember or are fans of the sights, sounds and fashions of the 90’s. He visited London to perform at Brixton Jamm, and we arranged for some affiliated press to coincide with the visit. For those familiar with DJ Muggs and his involvement with Soul Assassins and Cypress Hill, it was a surprise to some that he appeared to have a musical departure into the world of dubstep, a sound which first emerged from Croydon in South London. Dubstep has transferred across the Atlantic recently, with more clubs & events particularly in Canada and the United States’ west coast jumpin on the sound. In the interview with Han O’Connor for MTV UK’s online MTV Wrap Up, Muggs explains that this isnt necessarily a major departure for him personally. Quoting the early influence of German electronic techno legends Kraftwerk, and working with Goldie and Grooverider on previous jungle / drum & bass collaborations, he explains the heavy 808 kicks were standard back seat furniture in LA cars, so the heavier, deeper the sound, the better the impact! He touches upon his days with Cypress Hill and his work within various genres, obviously keen to look at how they can develop hybrid sounds and move in new directions. He recorded the track Snap Ur Neck Back with London’s Dizzee Rascal, and it was premiered on Zane Lowe’s BBC Radio 1 show during Muggs’ short stay.